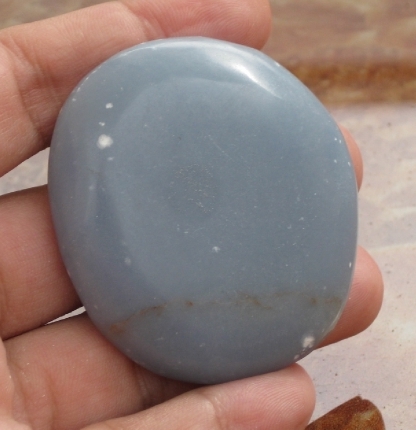 This lovely palmstone is slim enough to slip into your pocket to carry its angelic energies with you. Nice for meditation. It is a soft stone, so make sure it travels alone or well protected. Also keep away from water, dry methods of clearing its energies will protect its soft blue hues. Angelite is like powdery blue angel ice cream. It is the soft feel of a wing that leaves a breeze on your cheek. 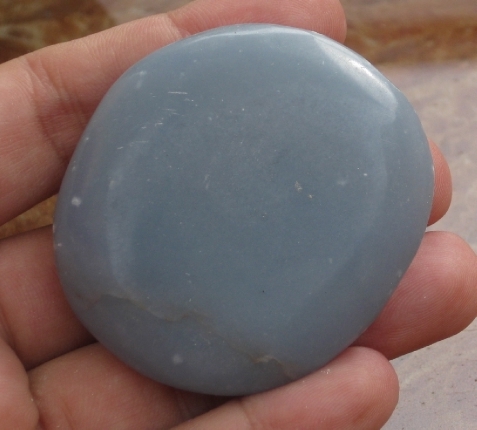 Angelite is an anchor for angelic consciousness on this planet. It comes from Peru, where many other angel flavored stones originate. Each nodule forms as a unique and independent being and looks somewhat like a pod or cocoon. It assists in connecting to the energies of the angelic realm which provide for a supported interface with your Angelic Guides. Angelite provides a protective field assisting in promoting a positive environment for astral travel and communication with guides. It assists with both sending and receiving of telepathic communication. It also dispels anger and negative thought patterns. It has been used to treat infections, throat afflictions and restore function of the thymus. Rather than stimulating the throat chakra, it helps to soothe this area. It helps one temper their words in time of anger, allowing one to think before they speak. It helps those who tend to chatter, slow down helping to bring all parties involved to better understanding. Its soothing qualities help one unwind from the day. Its energy is also conducive to better meditation and dream work. ***Important to note - Do not use salt water to cleanse angelite*** Another name for angelite is anhydrite meaning "without water".